One thing that I love to see in a photograph is movement. 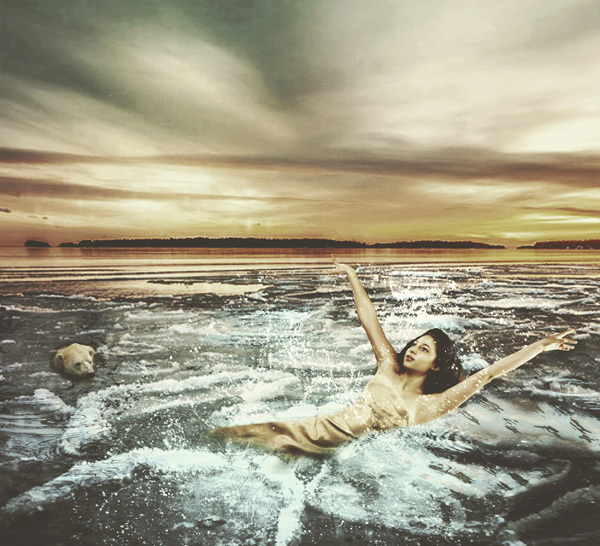 Movement makes a photograph come alive, but is also one of the hardest things to portray. Newer photographers have a lot to deal with, settings wise, and might not know how to tell the models to move, and newer models have it stuck in their heads not to move a muscle or the photographer won’t be able to capture the image. 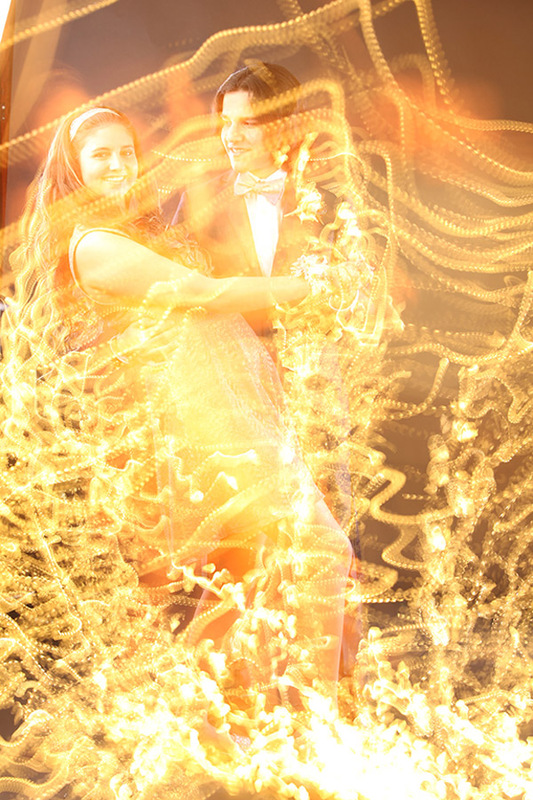 But not to worry, these tips are so easy, your subjects will be swirling around you in no time! There are many ways to show motion in a picture. You can stop the motion in mid move, blur, pan, have motion around your model while she’s standing still, you can have the model move. One way to make it easier on yourself is to start with a model who already knows how to move. Dancers, gymnasts, divers, and athletes of any kind have a basic understanding of movement, but you can make it happen with anyone, as long as you’re ready and have and idea of where you’re going. First: Have a game plan. 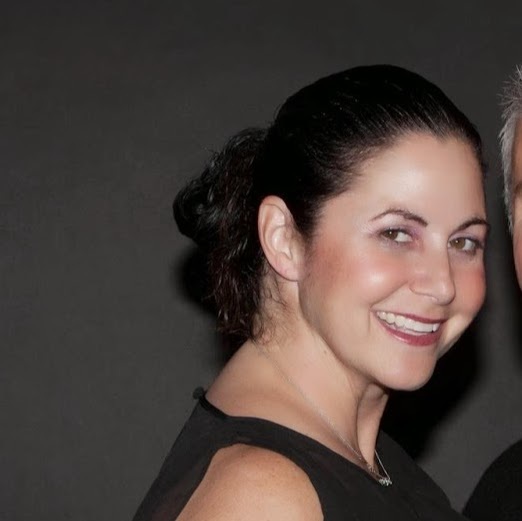 Know what you want the end result to look like, because then you have a goal to work toward. Even if your finished product doesn’t end up looking anything like, try to have a definite look that you’re trying for . Then put your camera in Manual mode. I know that this is scary, but if you aren’t using your camera in manual, you have a really expensive camera phone that you’re wasting because it’s telling you what it wants to do instead of you telling it what to do. Second: Know what your settings do. In order to stop motion, your shutter speed has to be at least 1/250 of a second, and if your subject is moving fast, 1/500 is even better. If you would like to do a blur, where the subject is in motion, or a pan, where it looks like the background is in motion, you need a tripod and a shutter speed of 1/15th of a second or slower. I like to use 1/8th of a second, but for now, let’s just stick to stopping motion. So, since you shoot in manual, and if you don’t, you should… set your shutter speed to 1/250th or 1/500th. If you’re using off camera flash, sometimes they will only sync to 1/200th of a second, so you can either set to 1/250th and have a black band on the side or bottom that you will then crop out, or you can make your room completely and sync to 1/200th or less . If you’re using on camera flash, push the little button on the flash with the “H” on it until the little “H” comes on the screen. That “H” means High Speed Sync, and when it’s on, in TTL mode, your flash will sync to any speed your camera is on. An interesting little tip is that if you have a pitch black room, you can leave the shutter open as long as you would like after the initial flash, allowing you to paint with light, or to just get a little ghosting. We’ll get to that later in this article. The easiest thing when you’re just getting started is to move objects around your model. That way they can concentrate on their pose and you can have an assistant throw stuff or create wind. Surprising your models is never a good thing. But neither is making an overly big deal of it. My dentist always takes a deep breath and steps away and pauses before telling me what he’s going to do to me. It’s not good. I get all scared and he ends up drilling the heck out of my tongue anyway, so don’t make a big deal of it, just tell them to keep moving, keep their shoulders down, and mouth relaxed, and everyone will be fine. 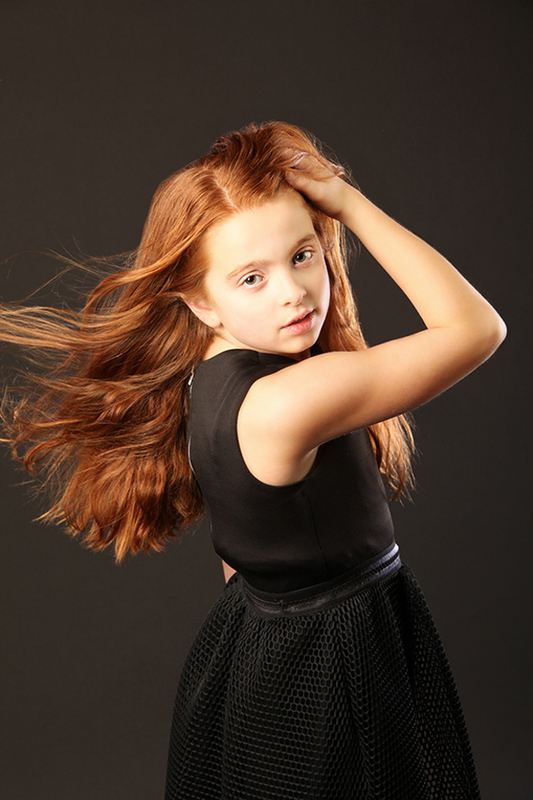 In this picture of Lucy, age 9, I used a fan to move her hair while she stood still in her pose. If you don’t have a professional fan, you can use a blow dryer (watch to make sure your own hair doesn’t get sucked up into the return) or even a sheet of cardboard or poster paper. 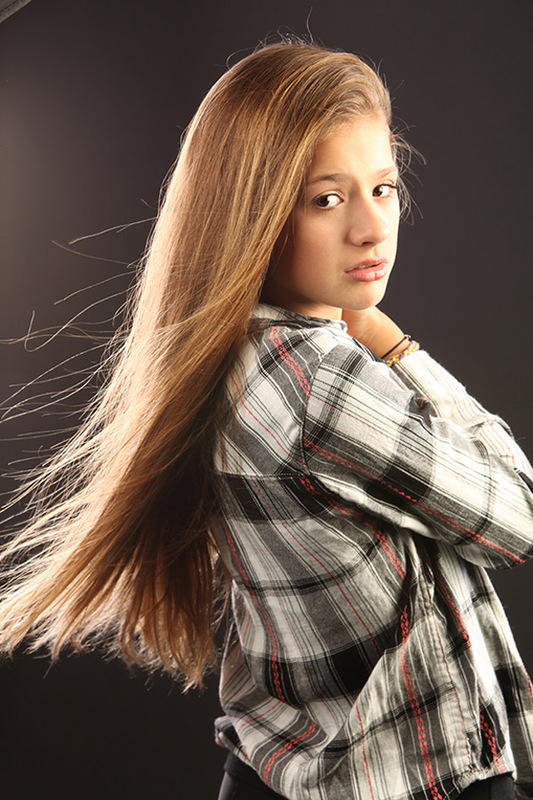 Stand to the side of your model, at about a 45 degree angle from the camera at about a little bit below face level, and blow the hair up. If the models have contact lenses or just don’t like the feel of wind in their faces, like Sophie, above, you can have them create their own wind by having your model face away from you and twirl toward you really fast… that creates a different, but still valid , kind of motion. Sometimes you want to give the illusion of a model moving, but you don’t have a lot of room for her to move. So you can move the dress instead. The most important part of moving the dress is to grab it from the very bottom of the hem, and then pull it out as far as you can, then fling the dress in an upward motion, and you can experiment with flinging it toward or away from the camera to see how the fabric falls. In this picture of Riley, for Fashions by Fowler, we were inside the store doing cutaways for a television commercial that was going on in the other room. We only had five minutes, and no space at all, so I told her to kick her foot forward, she struck her pose, and her mom, Stacy, standing next to her camera right, held the dress up by the very bottom of the hem. I gave a “1, 2, 3 kick” countdown, Riley kicked and arched her back, Stacy threw, and we gave the customer a good feel of how the dress would move when they’re getting their groove on at their prom. Are these tips too easy? Try an extended shutter speed shot! In this picture of Karli, for the Art of Cloth campaign, she stood in her pose, holding the tie dye purple scarf by the very corners in both hands. The other models and their moms threw the eight other scarves in front of and behind her. In this particular case, I had my f-stop pretty much middle of the road open, at f5.6, so that most of the scarves would be in focus, and then I had one mom stand really close to me camera right with the orange scarf, so that it would be kind of out of focus, but still pointing to Karli. 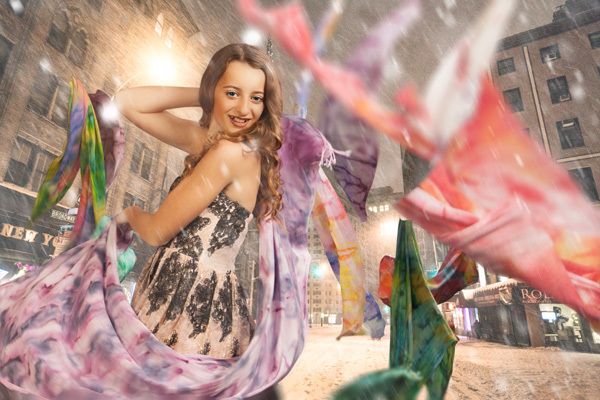 My shutter speed was at 1/60, and the modeling lights were on so that the texture of the garments still showed, but, thanks to the lights syncing at 1/200, Karli, who wasn’t moving, stayed crisp and just some of the moving scarf edges got some blur to them. On the count of 3, the moms threw the scarves, Karli dropped the one she was holding and I got the shot. 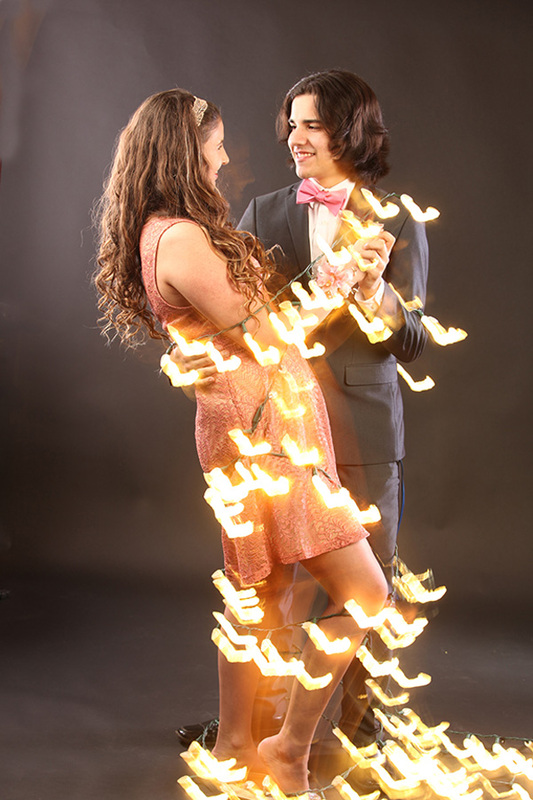 For this shot of Sadie’s Sweetheart Dance couple Zoe and Taran, I wanted it to look like they were surrounded by love and had hearts swirling all around them. 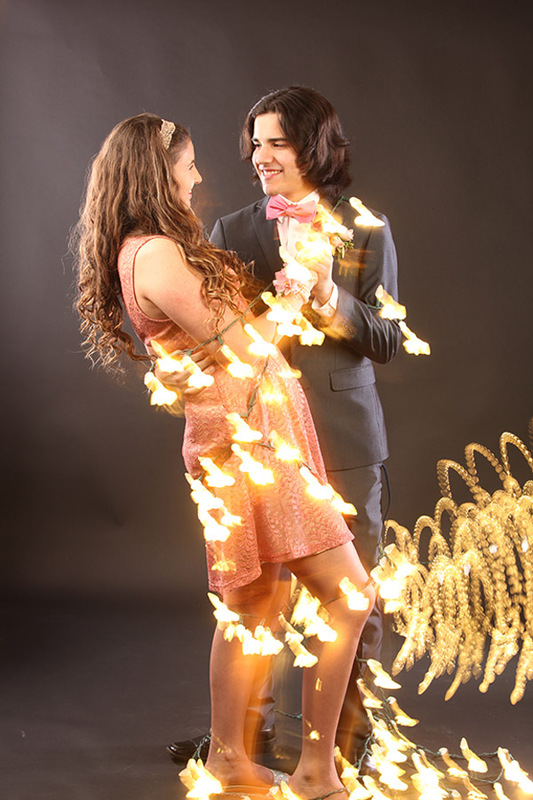 So I wrapped them in small Christmas tree lights and had my husband shake the lights. Zoe is my daughter, so knowing how hard I work to make every single thing just so, she granted me exactly 5 minutes to capture the memories to last a lifetime, and I’ll show you every frame we took. Since we were in pitch black with off camera flash, I got a bit overzealous and started with a ten second exposure, with my husband, Buzz and daughter, Tenley, waving the lights up and down. Kind of a cool effect, but kind of overwhelming, too, heavy ghosting, and there was too much light going in front of their faces. I had Buzz and Tenley take the top and bottom of the strands and just kind of gently wave them after the camera flashed and we were in darkness for 3.2 seconds. I really liked the flashes of light surrounding my couple, but I didn’t like the spirals of light by their legs… it was too distracting. For the third and final frame, I thought I’d see what would happen if I left the camera open for just one second after the flash, still in complete darkness, and just had them breathe naturally. Voila! The lights moved just enough to form little hearts all around them!! There is a little bit of ghosting camera right of Zoe’s face that you could easily clone out, but I kind of liked it, so I left it in. Heaven came to her shoot with the coolest light up shoes ever, and I wanted to show them, so for this shot, I focused the camera with the modeling light on, set my exposure for one second, then turned off the modeling light and had Heaven jump. The lights caught Heaven mid jump, then the darkness caught the shoes as she kicked her feet even higher and followed her back down to the ground, where the lights from the shoes burned their imprint in on the ground. There’s a bit of blur in her feet, from the light, which I feel, accents the movement, but the rest of her is tack sharp from being in pitch black, even though the camera was only at 1/200th of a second… the trick to that is getting a person at the height of their movement, between up and down. The way you can tell if you got it right is by having the image be tack sharp. This shot of Tenley is a composite. I wanted her to look like a femme fatale for an ad for a local polar bear plunge, like, “You don’t have to be athletic, just get in there and let’s raise some money”. I wanted to get her falling into the water in an elegant fashion, but since we live in Ohio and it’s freezing here, I couldn’t get any takers to get into hair and makeup, fall into our frigid lake in an evening gown ten or twenty times, and get dried off hair done and makeup re-done every time in between, so I decided to make what happened in my mind’s eye a reality. I first got a giant thick pillow. The one I use is actually a kind of futon from the LoveSac company. Then I tried jumping on it to make sure that it wouldn’t hurt my model. That’s a big one… you’re not going to get a great expression if your model just got a hip pointer. You could also use a trampoline, but I think that you can get too big of a bounce on a trampoline and that starts making your model’s facial skin bounce up and down as well… not super attractive. I jumped in about ten different ways in front of my model to show her that I can do it and it was fine, so that she felt safe. Then it was time for her to jump. I think that the most important concept is that you need to jump up first before you go down. This gives the model time to clear the floor and pillow so that you can easily cut her out. Tenley is a diver, so the concept was pretty easy for her. Other models wanted to just fall from a step stool, and even thought there was more time, it didn’t look anywhere near as good, and it started hurting them because they were falling from higher up. I had her jump into the pillow making “pretty hands” and keeping her face calm. 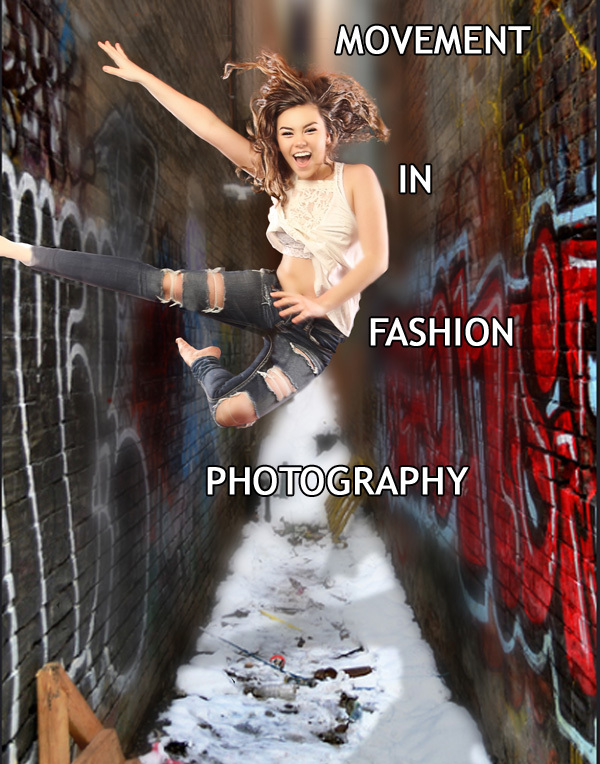 That’s a big one too, in moving shots… usually the model’s face, shoulders or hands tense up, but Tenley models a ton, so she just got into her groove, fell a few times, and we got the shot. Try a couple of these tips and see how it goes…photography isn’t a science, it’s an art, but it still gets frustrating when you aren’t getting it, so If you do a couple of shots and aren’t getting the motion effect you want, just drop me a line at barb@barbstitzer.com. I can take a look and give you a few tips to help give you the look of motion that you want. Let’s get better together! !